I’m sure by now you know I love making gingerbread decorations for Holidays.Aside from Gingerbread House I also enjoy making simple designs like this pretty Eiffel Tower or a unique Winter Berry Advent centerpiece or this dreamy Advent Star Decoration with candles. 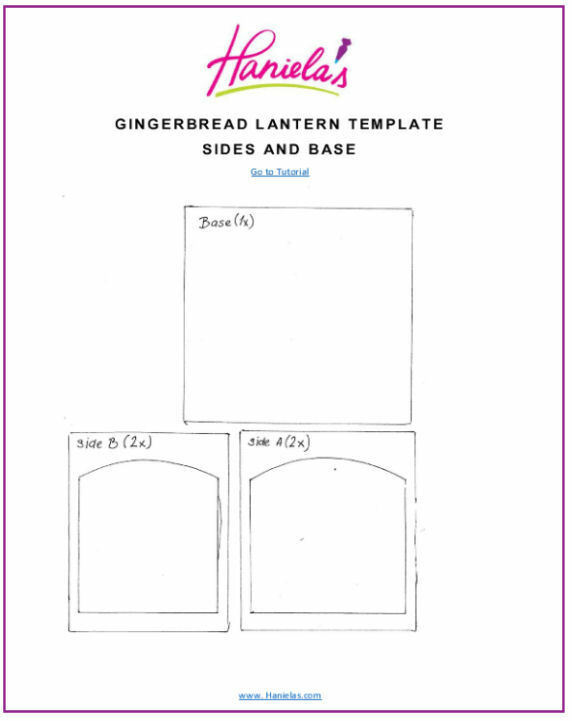 Without a further ado here is a tutorial on how to make a pretty festive Christmas Gingerbread Lantern Centerpiece. 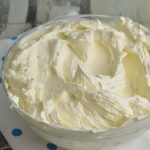 Fresh Royal Icing – for this project you don’t really need to use Lemon royal icing, simply omit lemon juice in the recipe and use water instead. Bench scrapper works great for cutting out panels. Alternatively you can use a ruler, too. I used card stock to make the templates. For the roof support you need to tape 4 smaller triangles. Cover the support with plastic wrap and then place cookie panels on it , gluing the edges together. Let dry overnight. Then carefully remove the support and finish decorating the roof. When cutting out side panels, make sure you adjust the width of 2 panels, 2 panels should be narrower than other 2. 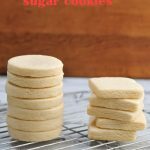 The amount depends on how thick you roll out your cookie dough. I rolled the cookie dough into about 1/8 inch. For example, theoretically a side panel measures 10 x 8 inches. 2 Panels should be 10 x 8 inches and other 2 panels should be 10 x 8- 1/4 (1/8 from right side +1/8 from left side) that makes it 10 x 7 3/4 inch. 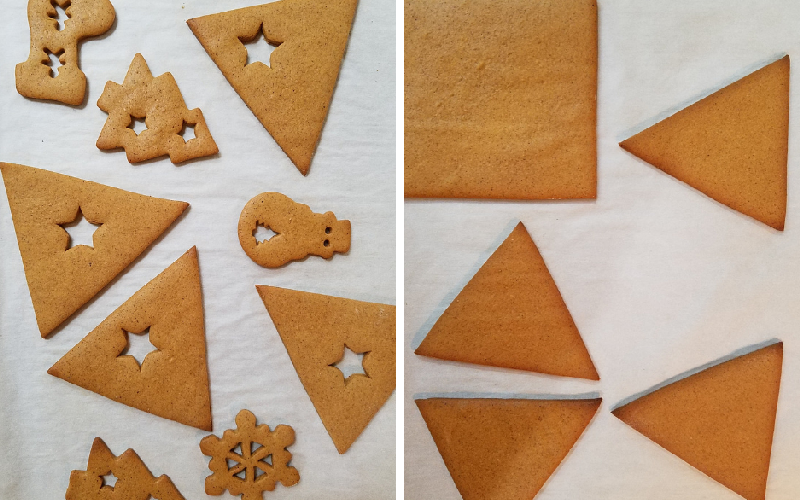 Roof template for the cookies : triangle measures a= 4 1/2 inch, b=5inch c=5inch. Side a being the bottom side. 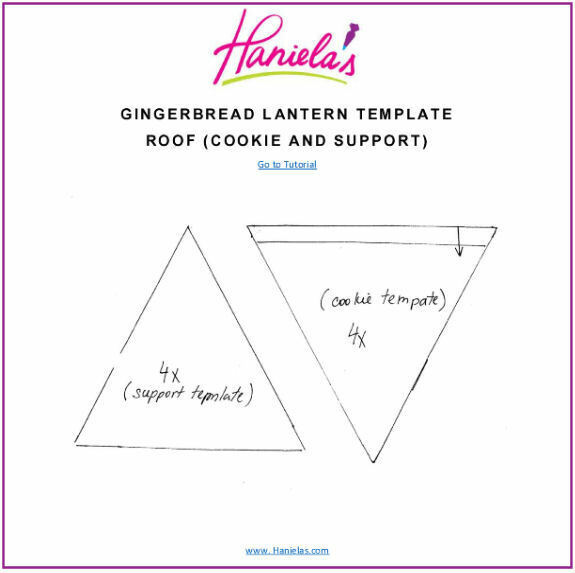 Roof template for support : a= 4 1/4 inch, b=4 1/2 inch c=4 1/2inch. Side a being the bottom side. 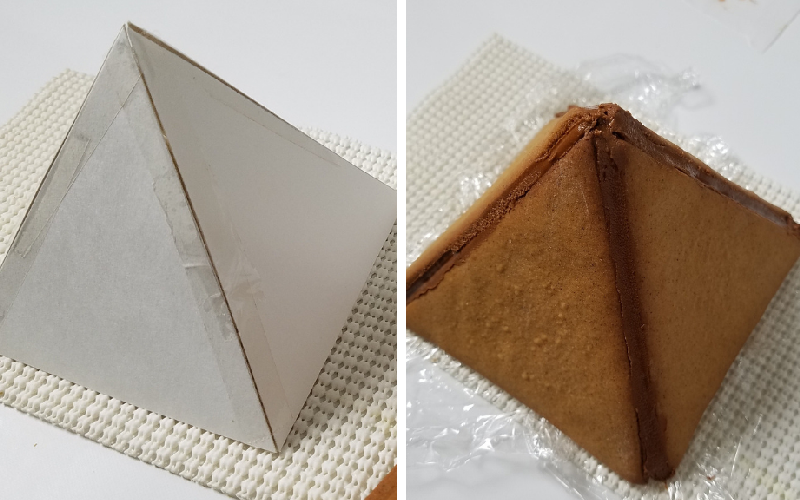 Cut it out out out of thick card stock, use tape to connect the pieces so form the support roof template. Base template is 5 1/8 inch by 5 1/8 inch. I use baking sheets lined with parchment. 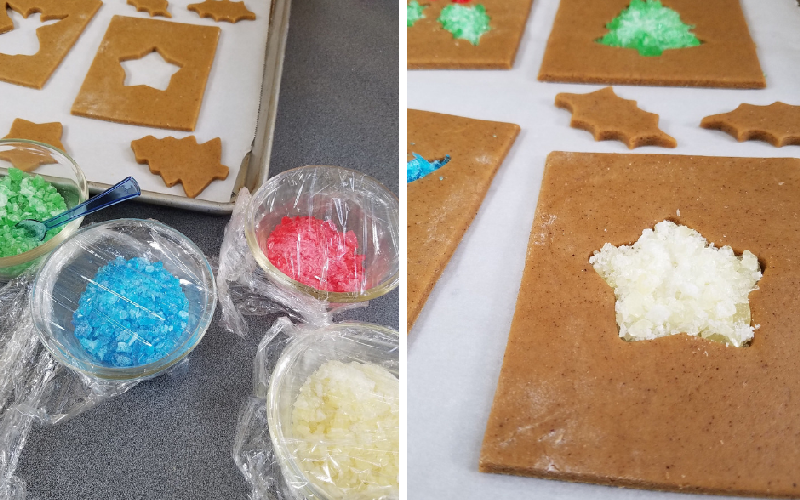 When using crushed isomalt or candies with this project, it is important to pre-bake the cookie panels. I pre-baked them at 350F for 7 to 8 minutes, then I let them cool and fill the empty areas with candies and bake again at 350F for another 7 minutes or so, until candies are melted. 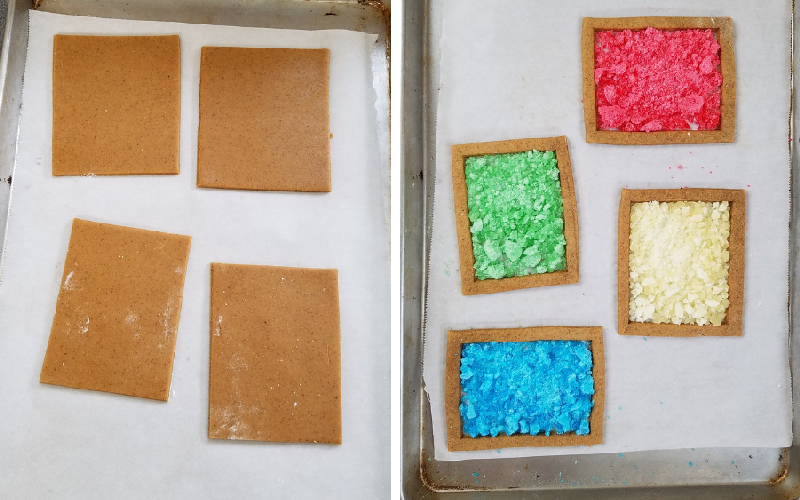 In case your panels are thicker, pre-bake them for a bit longer so they are baked through before adding the candies. Let the panels cool completely before removing from the baking sheet. 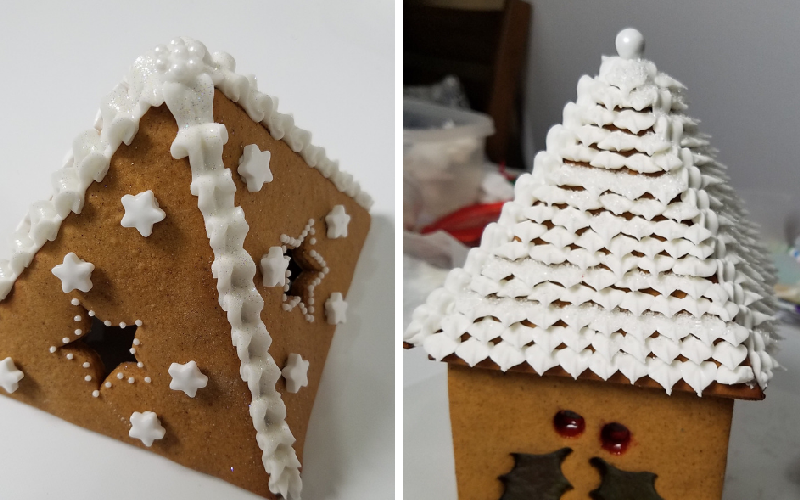 I used royal icing, simple star sprinkles and pearls to decorate. 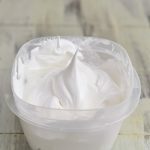 For decorative edges you can use piping tips. I used a leaf tip to make the roof. It is important that use use stiff royal icing to glue the panels together. 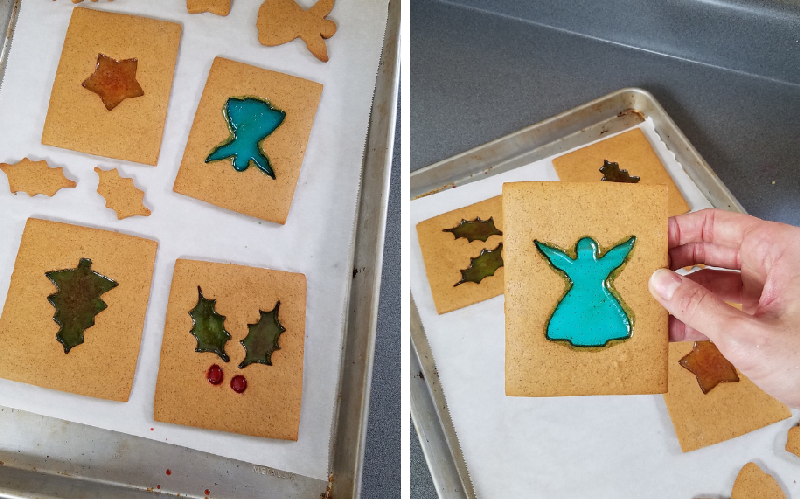 Royal icing shouldn’t bee too stiff as it will not stick to the cookie. First glue the base side panels onto the base. Let the icing cure overnight to ensure a strong bond. 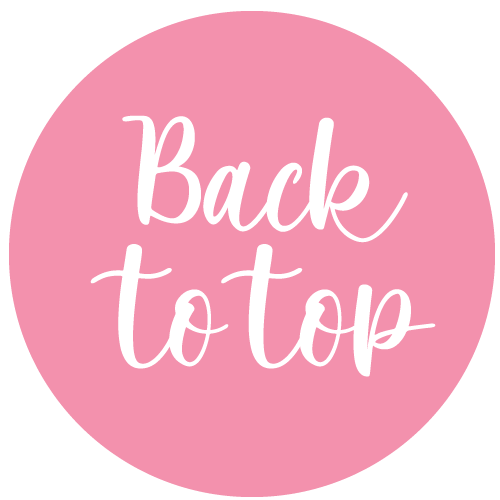 To assemble the roof, use a card stock roof support, cover it with plastic wrap and glue the larger triangle roof panels, let cure overnight. 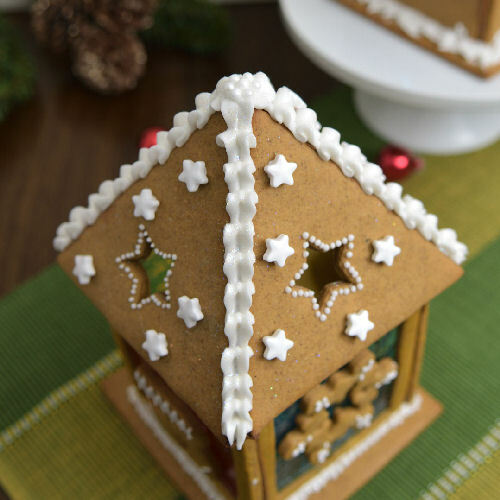 Finish decorating with royal icing. 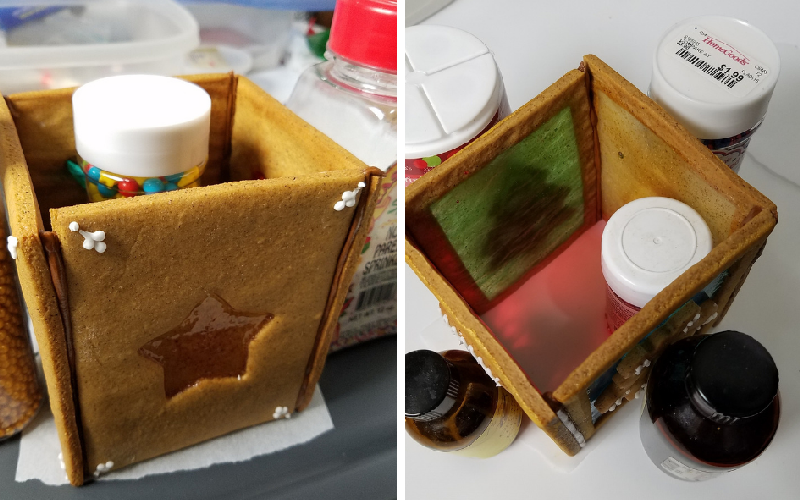 After all the pieces are glued and icing is cured, you can place a small led candle inside of the base and place the roof on the top. Here are the cookies, cooling on the baking sheets lined with parchment. Because of the cut out shapes I decided to crust the candies so it’s easier to fill in the cut out up to the edge. You can see in the picture that panels weren’t pre-baked. It’s better to pre-bake them. Because these are pretty large cookies I had to bake from longer. Once the time passed 7 minutes I notice candies were melted nicely, as I had to leave the cookie in the oven for longer they started to boil and there were lots of bubbles, and some of melted candies over boiled on the cookies. That’s why I recommend pre-baking these, especially if you are working with larger cookies. You can see cookie on the right were pre-baked; it was also useful when I was filling the opening with candies. I didn’t have to worry about the cookie dough becoming mishaped by pushing it with my fingers by accident. You can see how some of the candies spilled out of the angle cut out. 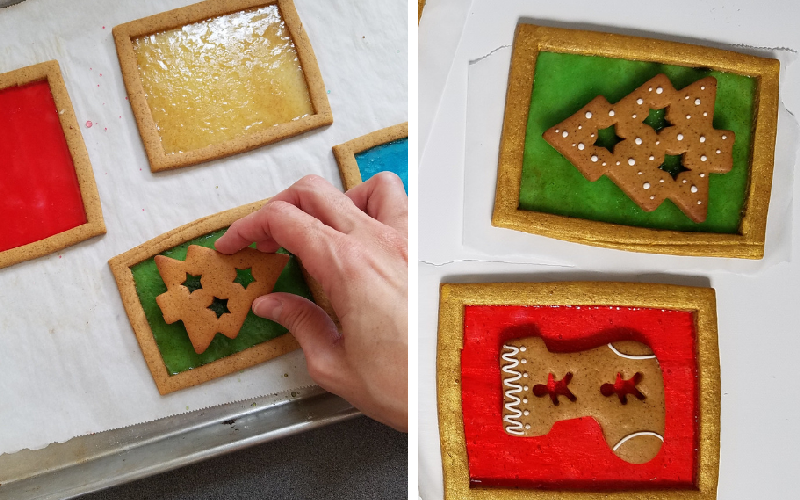 Make sure to let the cookies cool completely before removing from the parchment and attaching cut out cookies onto the stained glass panels. Use little bit of royal icing to glue them on. As I mentioned above I make a card stock roof support and I used to support glue panels under a correct angle. I let the roof dry overnight. Then I carefully lifted the cookie roof up and remove the support roof. Voila, roof is standing. Royal icing a great glue when building a gingerbread centerpieces. I colored my icing with brown food coloring so it blends nicely with the gingerbread cookies. Let dry overnight. 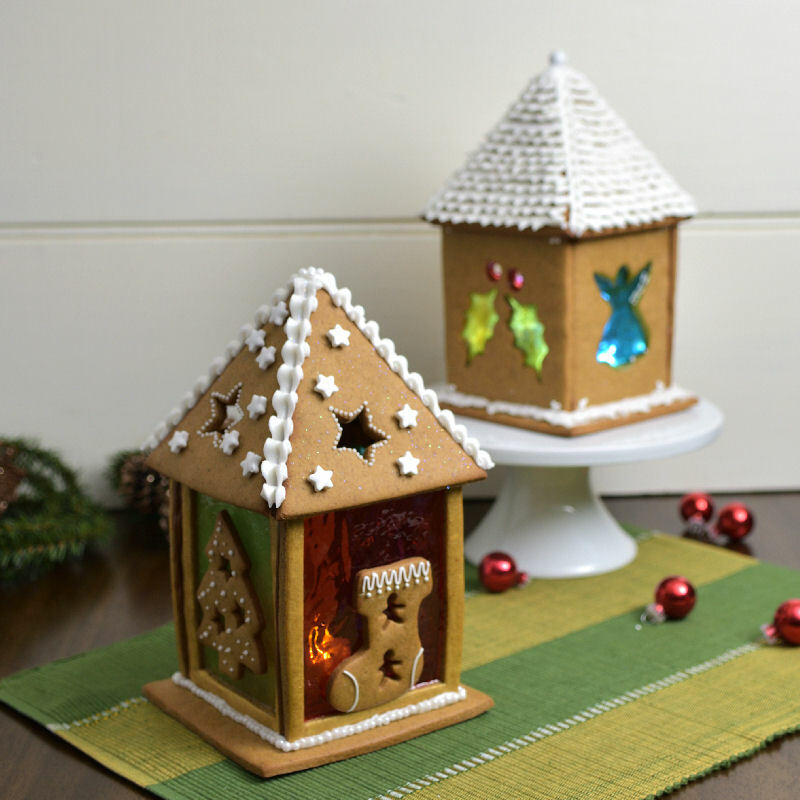 Once dry you can place a small led candle inside and place the roof on the top. As I had mentioned before, next year I’m definitely getting some Isomalt to make these. Candies started to melt a little in about a week or so. 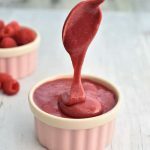 I think using melted sugar would also work but I haven’t tried that yet. If you can believe it, after so many year of making Christmas Gingerbread Ornaments and centerpieces. I suppose there is always next year. Leaf Piping Tip #352 works great for decorating the roof. I don’t have not don’t worry. Simply cut a V shape opening on your piping bag and you are ready to decorate. Use medium stiff royal icing. 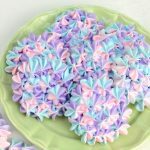 I also used star sprinkles or you can use Giant Snowflake Sprinkles instead. 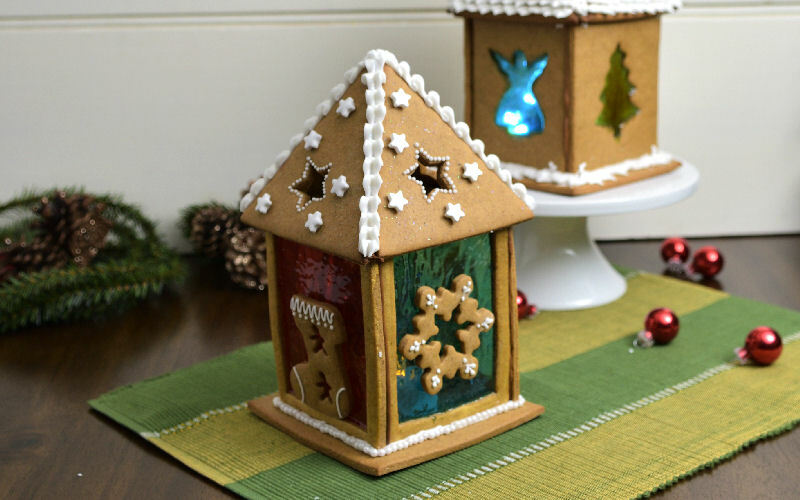 Attach them onto the roof with a dot of royal icing.